item North America's Line 8, diameter 14 series of linears is based upon profile choices with 8 mm T-slots and 14 mm hardened steel shafts and bearing units. 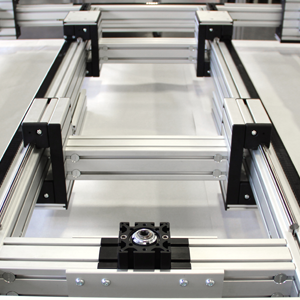 These units can be configured for a wide range of applications with significant weight handling capacity. Approximate weight capacity - 350 pounds or less Repeatability: +/- 0.15 mm (+/- 0.005") Positional accuracy: +/- 0.45 mm (+/- 0.017") Breakaway torque: 198 oz-in Maximum speed: 10 meters/second *Disclaimer - Specifications and data noted above are believed to to accurate and reliable for normal operating conditions. It is the responsibility of the end user to determine the actual suitability of any product for specific applications.